Thinking about giving a room a fresh look? Here’s a list of pretty green paint colors for every room in the house! I know I’ve been all about green lately, but since today is St. Patrick’s Day, that trend is continuing! Green is my favorite color to decorate with, although I tend to paint walls neutral colors and add green in ways of curtains, throw pillows and rugs. I do like a pretty green paint color in a room or two though for a fun pop of color. What better way to kick off St. Patrick’s Day than by looking through pretty green rooms? Then of course, you can get onto your other celebrations, whatever those may be! On a side note, who else is obsessed with Fixer Upper? In Tuesday’s episode, they painted the living/dining room walls green. What perfect timing for St. Patrick’s Day – and this blog post! 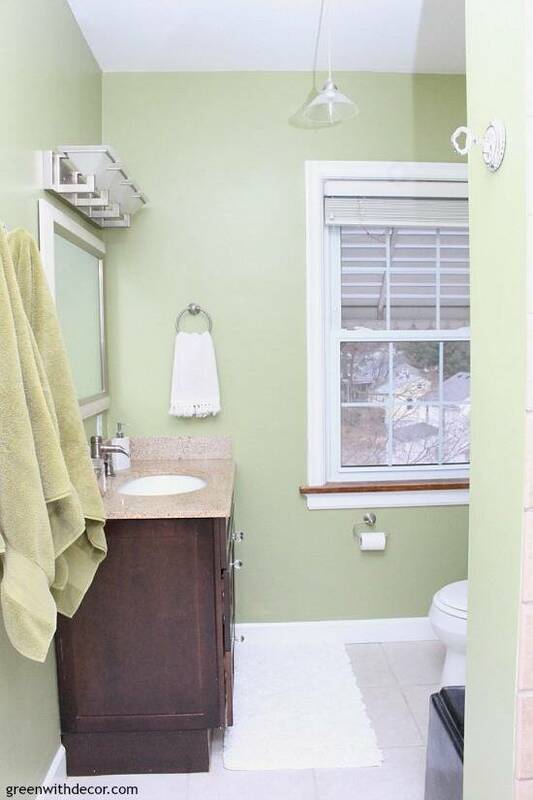 The walls in our house are pretty much all tan (Camelback by Sherwin Williams), but we added some color in the bathrooms with green paint. We went with Sherwin Williams’ Ryegrass, and I love it. It pops off the white tile we have in the upstairs bathroom and the powder room. We have Ryegrass in our rental bathroom, too. While I wouldn’t paint the whole house green, I love seeing all the different rooms painted green in everyone’s houses! What are your favorite green paint colors? Do you have a finished green room? I’d love to see a pic! Thanks, Steph! I love your green curtains! Meg – thank you so much for including us in your beautiful collection. Green is definitely a fave color! Of course! I want your craft room!